Welcome to day 3 of the September release from Newton’s Nook Designs. Hold on because I have A LOT to share with you today. 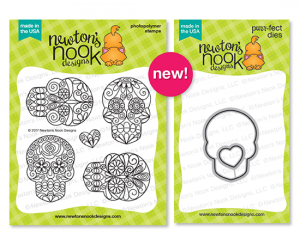 First of all, Newton’s Nook Designs has two (yes TWO) sets to share today. And then, well, it is Wednesday so it is also Freshly Made Sketches day. I did a little multi-tasking so that I could keep everything to one post. Are you ready?? First up is this marvelous new set called Beautiful Bones. These images are simply awesome and if you love sugar skulls, this set is going to blow you away. 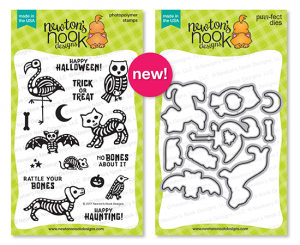 I also used the fun sketch from Freshly Made Sketches designed by the sweet and talented Amy O’Neill. This sketch was a natural to combine with the NND set!! 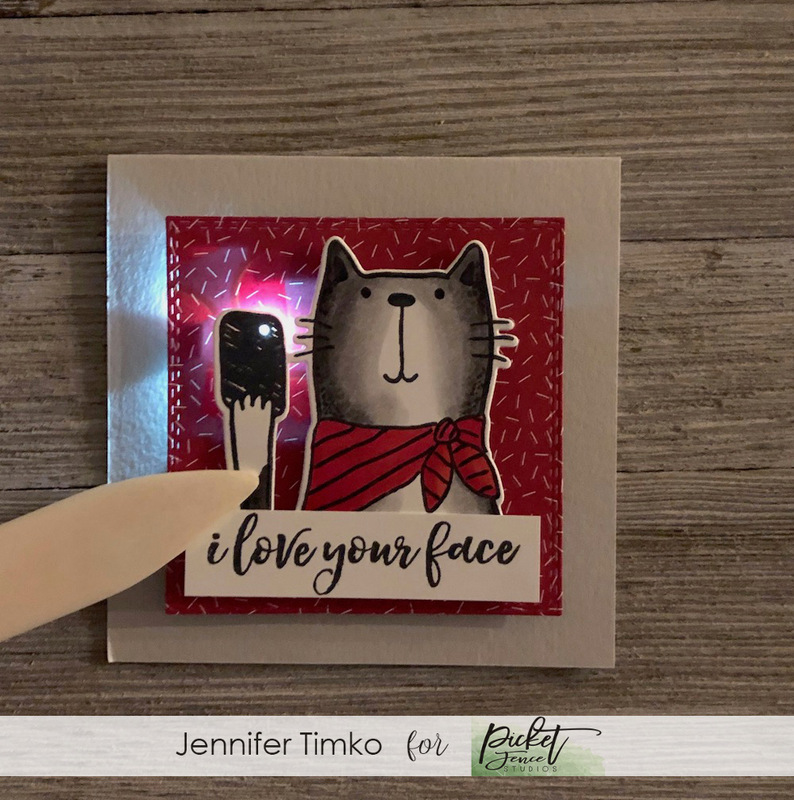 I lined up the images using my Misti (makes is super simple to make sure they are straight). Once I knew the placement, I put some Bristol paper under the images (uninked) and figured out where I wanted the watercoloring to be. 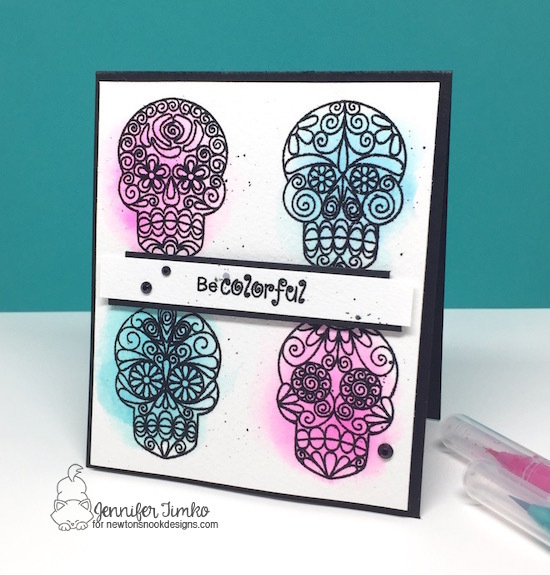 I used my Zig Clean Color Markers and added the bright colors…super fast and so striking with the set. Next I stamped in Versafine Onyx Black. I added some Wow brand Black Glitter Embossing Power and heat embossed. You should see how cool the glitter looks in person! I pulled a sentiment from Beautiful Plumage and stamped/embossed it too. I added some extra splatters and then some rhinestones (colored with a Sharpie) for a little more sparkle. The perfect card to send out to some family members who live in Mexico and have fun with Day of the Dead celebrations. For the next set called Spooky Skeletons, I created a card to look like an X-ray. Now, I would love to say that the X-ray was all my idea but sadly, no. My oldest son saw the stamp set when I first got it and told me “that would make a cool X-ray…can you do that?” Why yes I can!! 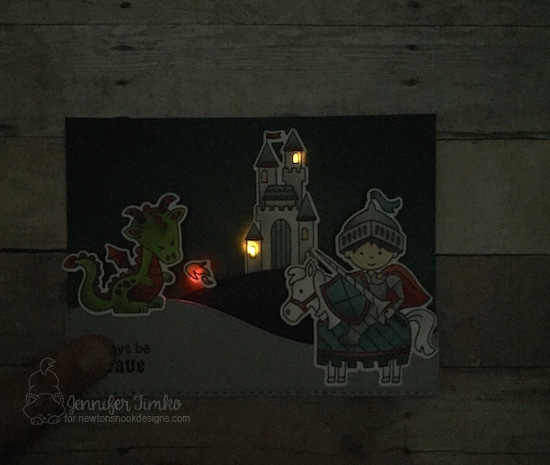 I used Chibitronics and two white lights from the kit to backlight this image. 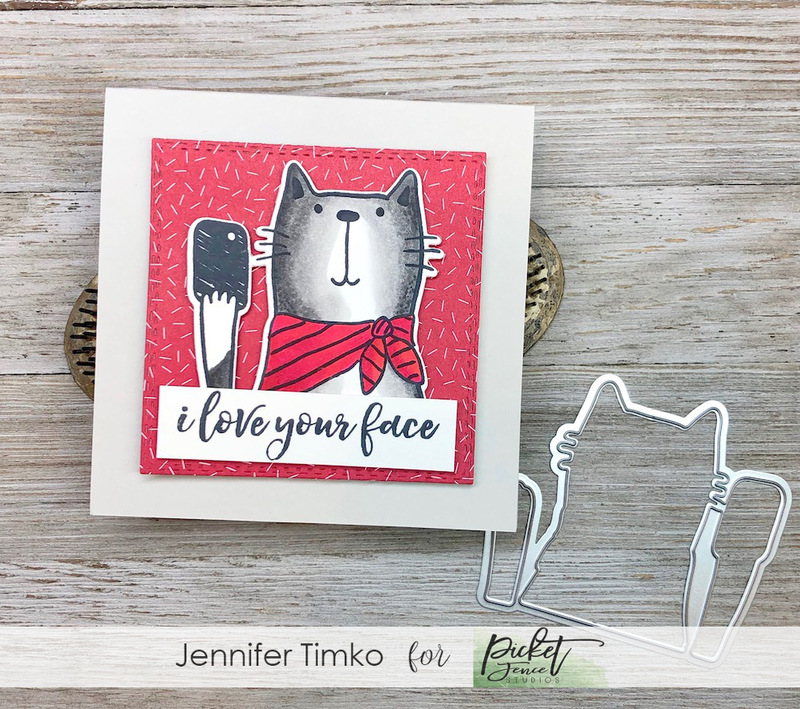 I stamped the kitty skeleton on vellum and put that layer underneath another vellum piece surrounded by the cute tag. I helps conceal the Chibi tape and still let’s you see the lights easily. Want to see it lit up?? Of course you do! My trusty assistant (my oldest) helped me by pushing the ribbon on the tag. For some reason the lights seem way brighter in the video but it has a distinctly X-ray look in person. He LOVED it so mission accomplished! 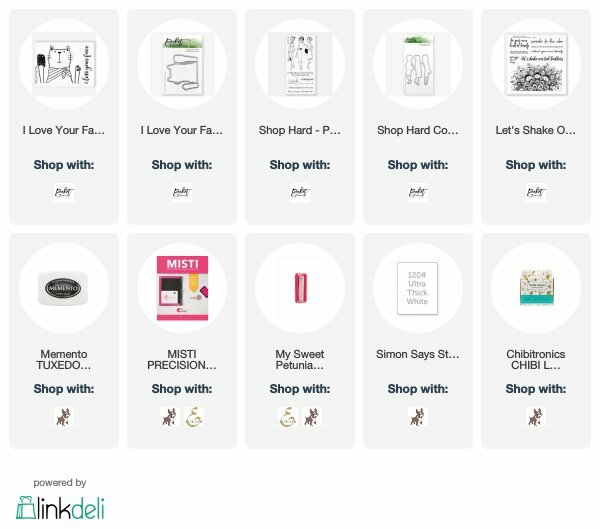 I hope you enjoy all of today’s products. 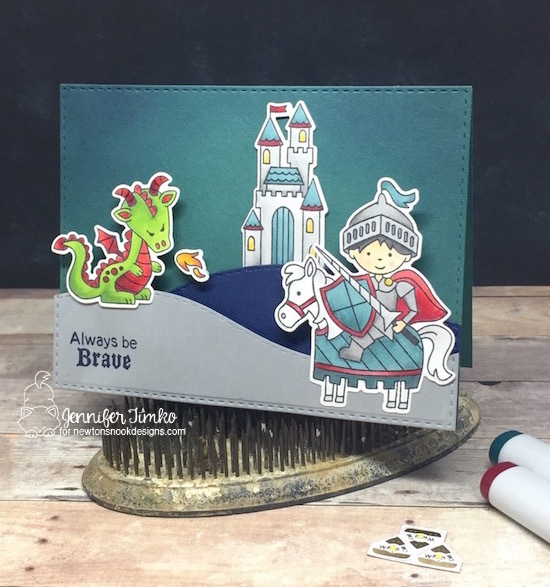 Remember that there are matching dies with the stamps too! And on to someone getting to win! Would you like to win the “Beautiful Bones” or “Spooky Skeletons” Stamp Set? These sets will be given away to ONE lucky winner each! Thanks for stopping in today and during this whole week. Make sure you stop back in tomorrow for the last day of the release. One more set and I think you will be over-the-top excited when you see it.